A-HOTEL.com - Luxury and cheap accommodation in Gon'ba, Russia. Prices and hotel, apartment booking in Gon'ba and surrounding. 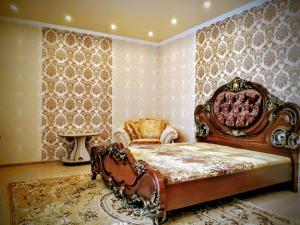 Hotel Aeroport is located in Barnaul, 50 metres from Barnaul Airport. Free Wi-Fi access is available. Located in Barnaul, 15 km from Avalman Ski Lift 1, 15 km from Avalman Ski Lift 2 and 15 km from Avalman Ski Lift 3, Апартаменты на Новгородской 14 provides accommodation with a balcony and free WiFi. Guests staying at this apartment have access to a fully equipped kitchen. Featuring free WiFi, this hotel is located 7 km from Barnaul Train Station. It also offers a plunge pool and air-conditioned rooms with a fridge.